Atomic Absorption Spectrophotometer AAS-4100 is a high performance automated instrument designed to meet the requirements of the modern laboratory. Due to its versatility and performance it can be used for a wide range of applications including: Agricultural, Clinical, Environmental, Food, Metal, Mining, Geological, Petrochemical, and Pharmaceutical. The Fully Automatic Fast Sequential Multi-Element Analysis Combined Automated Flame and Graphite Atomic Absorption Spectrometer system is equipped with an EIGHT Hollow cathode lamp motorized turret Atomic Absorption Spectrophotometer. All electronics, gases, analytical data and the graphite furnace are fully controlled via the AAWin3 Software for maximum safety and optimum performance. A data coded Air/Acetylene Burner is included. 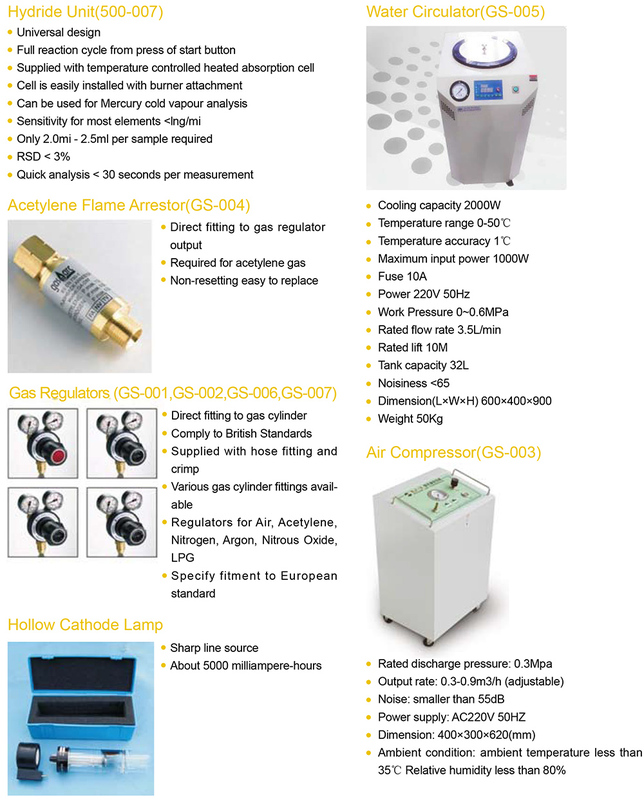 (Nitrous Oxide/Acetylene and Air/propane data coded burners are also available as optional extras). The instrument is equipped with both Flame Atomizer and Graphite Atomizer as described above. Both configurations are installed into the instrument and can be changed over by a simple selection in the versatile AA- Win Pro software. The instrument is equipped with a flame atomizer. The positioning of which is fully controlled by the embedded computer system and the AA-Win Pro software. Three flame options are available to the user with the Air/Acetylene being the standard configuration. This flame can be used for nearly all standard elements while the N20/Acetylene and the Air/LPG (Natural gas) are available as an option for the more demanding of elements. All three flame configurations offer a coded burner for full safety protection. The instrument is equipped with a Graphite Furnace Atomizer. The graphite head is fixed into the optical path to maximize performance and eliminate drift. The temperature of the transversely heated graphite tube is accurately controlled by means of a precision feedback system. 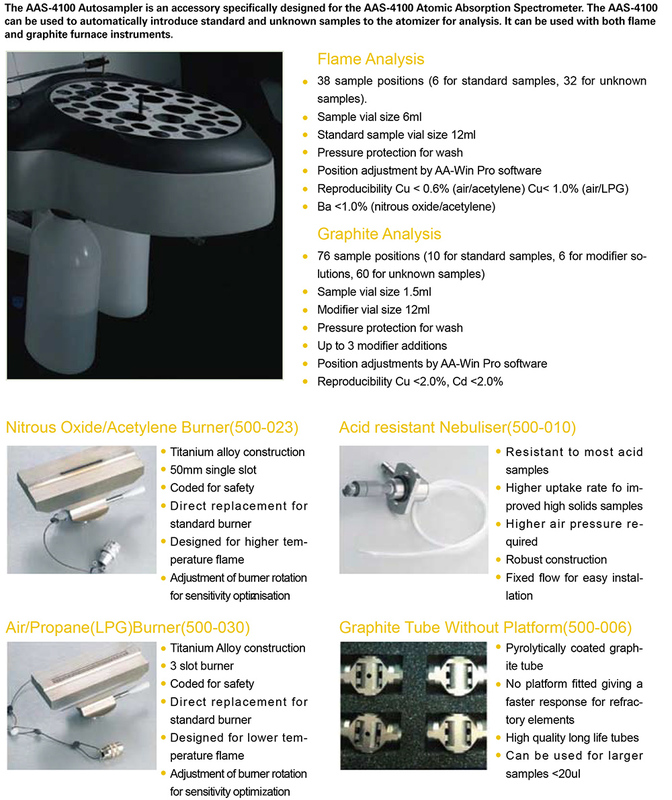 Pyrolytically coated platform tubes are supplied as standard to improve the performance and eliminate many analytical problems associated with this technique. The Fully Automatic Fast Sequential Multi-Element Analysis Graphite Furnace Atomic Absorption Spectrometer system is equipped with an EIGHT Hollow cathode lamp motorized turret Atomic Absorption Spectrophotometer. The graphite furnace heating cycle, all electronic functions, analytical data and gases are fully controlled via the AAWin3 Software for maximum safety and optimum performance. TPC System is used to control the instrument. Pre-installed AA-Win Pro software, user manuals, cook book and Windows 7 professional operating system. 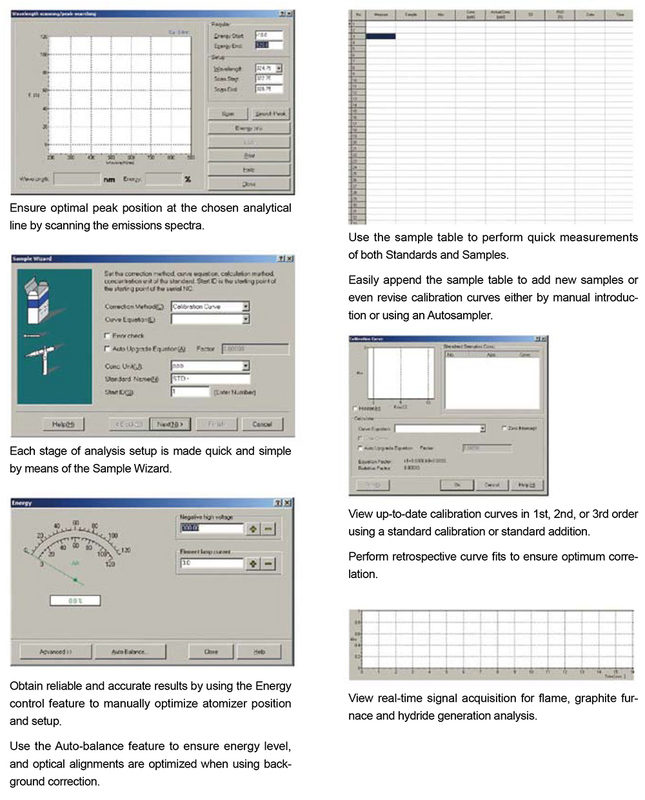 AA-Win Pro software provides full control of the instrument and autosampler with easy method change for each technique. Automatic 8 Hollow Cathode lamp turret controlled and optimized by the AA-Win Pro software. Operating lamp current and warm-up lamp current can be individually controlled to eliminate drift commonly associated with lamp warming. D2 lamp background correction system fitted as standard to all configurations. High energy D2 lamp and adjustable beam splitter mirror are optimized by the AA-Win pro software. Self background correction system fitted as standard to all configurations. The high performance background system uses the same hollow cathode lamp as installed for the analysis. Minimum extra components are required and optical alignment is very simple. Self Reversal can be used for any element at any wavelength, making it extremely versatile. A universal autosampler is available as an optional accessory which is conveniently mounted on the front of the AAS-4100 instrument. The Air/Acetylene flame uses a 100mm single slot burner for the standard configuration. The high sensitivity (Cu 2ppm >0.280abs) is due to the efficiency of the fixed position glass nebulizer fitted as standard. An acid resistant replacement is available as an option. The flame can be easily set from blue lean flame through stoichiometric to fuel rich by means of computer control. The N20/Acetylene flame uses a 50mm single slot burner and is available as an optional extra. This flame configuration is used to measure elements less prone to ionization such as: Aluminium, Tin, Titanium, Calcium, Vanadium and Molybdenum. Switching from Air/Acetylene to N20/Acetylene to Flame Off is fully controlled by the AAWinPro software. This flame uses a 3 slot burner and with the Iow pressure requirement, it is also much safer to operate. Due to the low temperature of the flame, it is ideal for analyzing alkali metals such as: Potassium, Sodium and Lithium, especially when used in the emission mode. Some remote areas of the world have difficulty obtaining Acetylene gas of a high enough purity to operate the flame correctly, LPG can give a real alternative and offer comparable results for most elements throughout the wavelength range. In the AAS-3900 instrument, the graphite furnace head is fixed into the light path, so alignment with the optical path is simple and accurate. In the AAS-4100 instrument the graphite furnace head is fixed behind the flame atomizer assembly and is motorized into position by a simple operation in the AA-WinPro software. The positions for the flame and graphite are saved, making it easy to swap between modes for different analysis. Pyrolytically coated graphite tubes are used as standard and are manufactured to improve performance, as well as to increase the analytical life. Platform graphite tubes are supplied as standard and will accept volumes up to 20ul. Non-platform graphite tubes are also available as an optional extra. 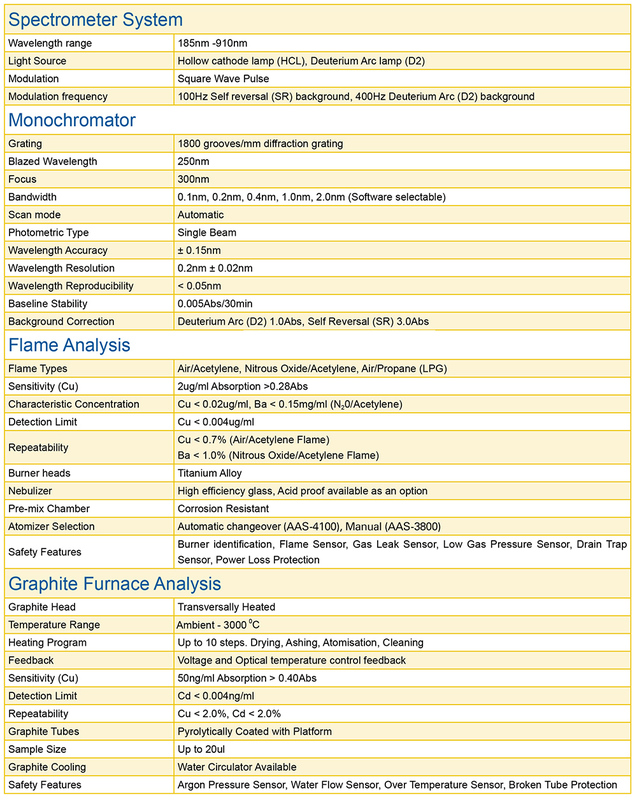 Up to 10 heat stages are available for the programming of the graphite atomizer. These can be set and stored within the AA-WinPro software. The graphite tube is held in position by means of a gas piston. Replacement of the graphite tube is performed by a simple command in the AA-Win Software. The graphite tube is efficiently cooled by an additional water circulation system (supplied separately). 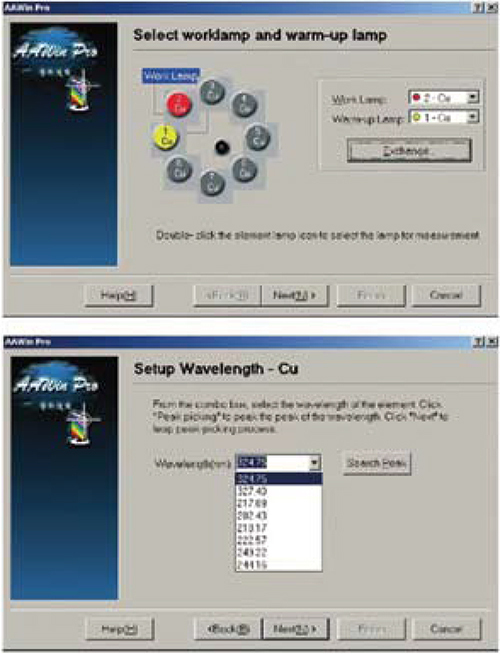 AA-Win Pro Software is a powerful and intuitive software product designed to allow control and data acquisition from the AAS-3800 Atomic Absorption Spectrometer. 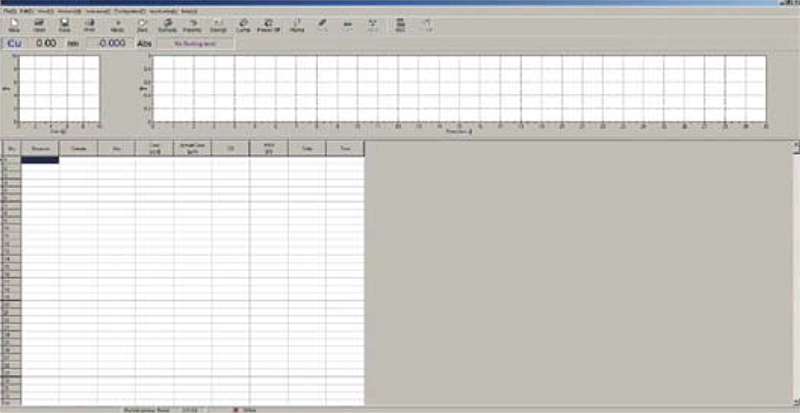 The AA-Win Pro software allows the Analyst to control all aspects of their analytical method while providing an extensive range of tools for data collection, storage and interpretation. The software interface consists of three key workareas, whilst having toolbars to access many others. These work areas allow the user to view real-time signal acquisition, up-to-date display of calibration curves and a flexible	sample table. Lamp turret setup, operating and warm-up currents, along with the desired analytical wavelength are easily selected in the configuration.